Incredible northern experiences and plenty of things to do! Action packed and truly beautiful, Fairbanks’ winter season is guaranteed. See the captivating light of the aurora borealis, view larger-than-life outdoor ice sculptures and experience the exhilarating sport of dog mushing. A surprising amount of winter events make the winter season a traveler’s snowy paradise...skiing, ice skating, snowmobiling, snowshoeing, ice fishing, curling, tubing and ice hockey abound! Fairbanks, Alaska is truly a traveler&apos;s paradise because there is so much to do! Challenge the snow-capped hills or birch-laden trails or mush a team of huskies across the wilderness. Behold three-ton pieces of ice being turned into works of art. Journey above the Arctic Circle, visit Santa in North Pole or discover the incredible warmth of an Alaska hot spring at the end of an adventure-filled day. Plan an incredible winter expedition in this sparkling land of aurora, ice and snow. Explore Fairbanks' video illustrates how to dress for winter and celebrate time spent outdoors. Stay warm out there! 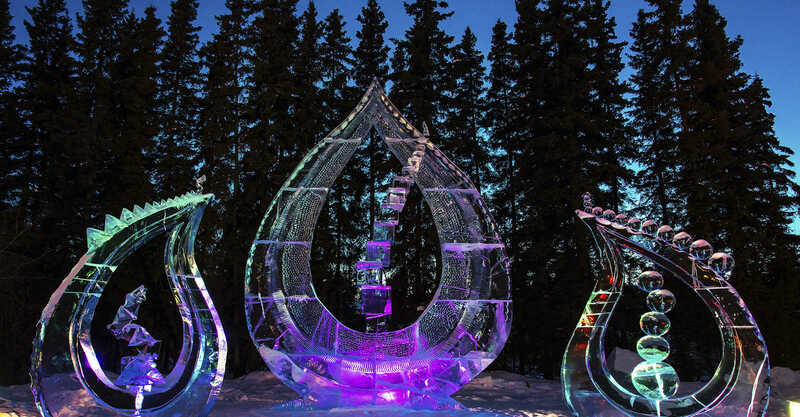 In Fairbanks, ice art is not only remarkable but commonplace during winter months. Locals and visitors alike enjoy the fantastically fun Christmas in Ice during the holidays in North Pole, a multitude of impressive ice sculptures around the community and the Kids Park and an International Ice Art Exhibition in February and March. The ice art is awe-inspiring, but it can also be interactive. Both Christmas in Ice and the Kids Park find creative and beautiful ways to have fun, like attending any children&apos;s playground, only the "equipment" is constructed entirely from ice! There are slides and rides for all ages, mazes and life-sized sculptures of animals, and characters to touch and climb on. Climb atop a polar bear, slide down a dragon’s neck or crawl through a giant maze. Ice art sculptures in Fairbanks rival those wrought in stone and never cease to capture both the mind and the imagination. Talk about a trip of a lifetime! The magnificent scenery. The breathtaking outdoors combined with warm and welcoming hospitality has made Fairbanks one of my most memorable winter adventures, anywhere in the world.